I'll be busy this week moving in to a house after 3 months of living in hotels. It's a good opportunity to do a second annual NO WEBLOG FOR OLD ROBOTS WEEK. Except unlike last year when I put some effort into it, this time I'm just phoning it in. So enjoy this week's store appearances themed series of ads where various Floridian malls and marts from over 20 years ago rolled out the red carpet for a variety of guests hailing from Tatooine, Symbion, Eternia and wherever Donkey Kong comes from. 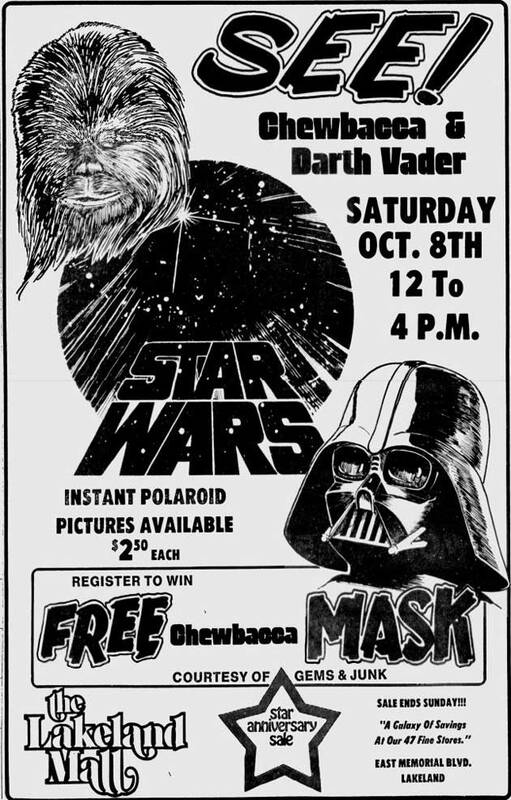 TODAY: Lakeland Mall in Lakeland, Florida hosts Chewbacca and Darth Vader on October 8th, 1977. Check it out at Google's newspaper archive. Awesome line of the ad: "Instant Polaroid pictures available"! Good luck with the move. I have often saidyou have no idea how much crap you own until you move into a different place. I'm more interested in finding out how much of my crap the movers now own! Hopefully, they own exactly zero. Or there would be deathings. I saw something recently that will never allow me to see Chewie in the same light again. Whoa! Didn't know Chewie was that much of a perv! That's kinda awesome in a sick, twisted way. She really gets around! Have you seen that tattoo of her and R2-D2?